Nakagusuku Board of Education Cultural Office head Shin Tokuchi standing next to the wall he discovered. The yellow stones in the middle hail from the early 14th century. Closer to Tokuchi is the more recent wall constructed in the early 15th century. January 23, Nakagusuku Castle Ruins. 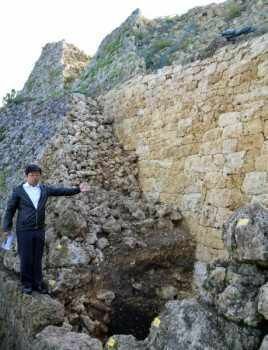 Nakagusuku – A castle wall that appears to have been constructed in the early 14th century was discovered at the Nakagusuku Castle Ruins. The wall was found on the inside of a more recent castle wall constructed at the end of the 19th century. The Nakagusuku Board of Education (BoE) made the discovery while removing stones as part of ongoing castle repairs. It appears to have been constructed during the time of a Nakagusuku chieftain prior to the more well-known folklore of when Gosamaru inhabited the castle. Previously, it was believed that Nakagusuku castle was constructed in the latter half of the 14th century, however as time moved on, the history of the castle could have been re-written. A piece of Chinese pottery that indicated the earth serving as the foundation for the wall dated from the end of the 13th century to the start of the 14th century was discovered, and this led to the determination of the approximate date of when the wall was constructed. There were other unique characteristics such as shaved off corners, delicately manufactured quarried stone, and neat stacking that indicated it was constructed after Ichi no Kaku. 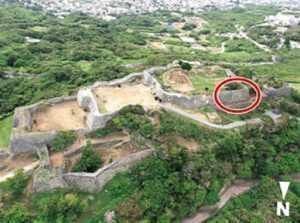 In the first half of the 15th century, either the chieftain at the time of Gosamaru constructed a new wall on top of the one just discovered. The wall was 13 meters in height, and is an expansion of Ichi no Kaku. It appears to have been built to fortify the defenses of the castle. The discovered older wall was completely covered by the newer wall built over it. As the months and years passed on after its initial construction, the damage of the wall began to show, so the new wall was built over it, preserving the older wall on the inside.